It was definitely time to leave the land of nothing but beaches. There are good cycle paths here but all they really do is connect all the beaches. Clearly, what one is supposed to do cycle to one’s chosen beach, lie in the sun all day having the occasional dip in the sea to cool off, then cycle back rubbing the abrasive sand well into one’s backside. Definitely not us! Carol had found another marsh area just a little way up the coast by an island, the Île de Noirmoutier. There was a suitable sounding campsite run by a Brit near St. Gervais, too, so we thought we’d give that a try. After a last trip into La Tranche-sur-Mer to buy bread and a postcard of the embarrassingly stranded cargo vessel on the beach at Les Sables d’Olonne, we set off on what turned out to another lengthy trip of 50 miles. The campsite looked great with very generous pitches so, without further ado, we got Billy set up in his new home ready for lunch. The farm on which we are camped lies between two march areas, one to the north and one to the south. We set out for an initial exploratory trek a bicyclette and were quickly in some much more interesting countryside. The first sign we saw was for a farm selling foie gras but I think we’ll give that a miss ‘cos this is another primarily oyster farming area. 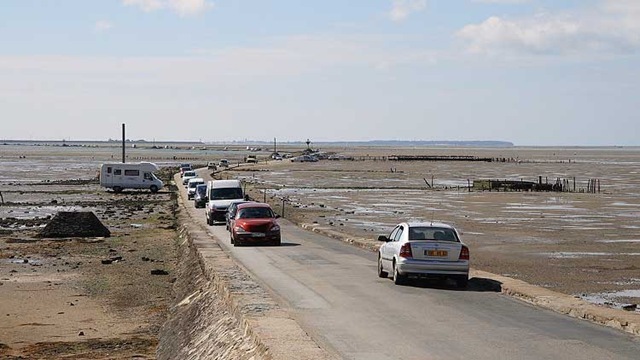 The map showed an interesting road over to the Île de Noirmoutier called the Passage du Gois. What made it sound interesting was the note on the map that says "route practicable a basse mer" (road passable at low tide). That was just begging to be investigated. We cycled through Beauvoir-sur-Mer first. The draining of the marsh areas along this coast have led to some apparent anomalies. There are a number of towns, such as Beauvoir-sur-Mer, which are no longer sur mer (by the sea) but a few kilometres inland. There are even "ports" which no longer have a port. Excitement increased as we approached the Passage du Gois. 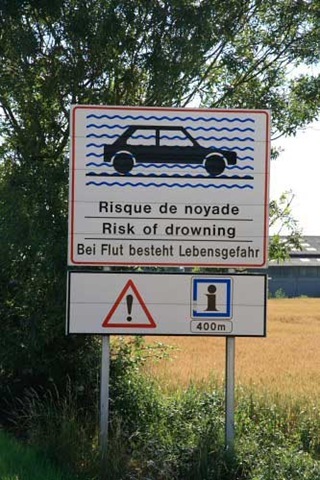 A wonderfully practical road sign depicted a car submerged in water accompanied by the dire warning, "risk of drowning". Terrific! At the beginning of the road itself is a board showing the time of the next low tide. The crossing, about 5 kilometres, is practical for 90 minutes either side of low tide. In a brilliant stroke of luck, we had arrived at 5:30 PM, 45 minutes before low tide. What a wonderful sight. Not only was traffic streaming across, but people were driving out into the middle of the causeway, parking, and digging for clams. There were dozens of them (people, not clams). The French practice of fanatically harvesting a source of free food is so indicative of a nation with a passionate interest in gastronomy. Given the timing, we just had to cycle over to the Île de Noirmoutier and back again. 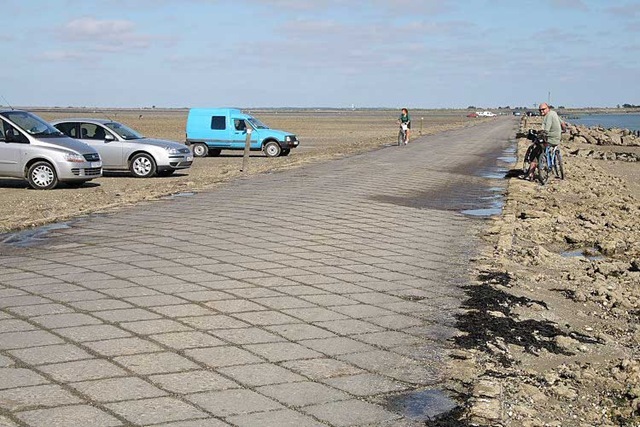 The underwater road was built between 1935 and 1939 of diamond-shaped paving slabs. Some of these remain and give the bikes and, therefore, ones backside, a serious pounding. Some sections have been replaced by tarmac and these provide a blessed relief to the vibro-massage provided by the paving slabs. This place is great. What a difference 50 miles can make.